First of all they spawn in the water section Northeast of the Island with the docks and merchants. The PH is "A Twilight Sea Minnow". 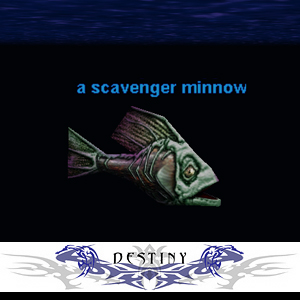 There are a total of 26 Twilight Sea Minnows and 1 Wetfang/Grimfang Minnow. When I arrived, 55 Bard with tracking, there were 3 Scavengers up. Killed them, each had a different drop, but not the ones I wanted. Began killing TSM's by starting with the oldest ones on track. Eventually I spawned another SM but I didn't kill it. Just kept killing the oldest TSM leaving the WM/GM as a list marker. Once the oldest were dead I killed the WM/GM. Since no one else hunts this stuff anymore I was able to do this every day for over a week with no one coming in and killing my spawned SM's. Eventually I had 7 SM's up but couldn't seem to get anymore. (I assume that like many Luclin spawns like this that there are 8 that spawn 2 possible named and a PH.) Since I was going away for a week I decided I'd better take em out. All 7 made different drops and the 7th one was the drop I needed (Whew). It appears that there are 8 SM/TSM pairs in here, the biggest problem is that the target mobs are all named the same. I can't think of any better way to ensure that you get your target than to spawn as many SM's as possible before killing them, gives you better odds in getting your drop. I tried Fear Kitting and Charm Kitting but found Chant Kitting to be the most effective, was able to target and Chant Kite all 26 TSM's in the time it took for the first to start to respawn. This was done Post AE nerf so I don't know if the old DDD Kite would have been effective. They do hit hard! Be especially careful around the tunnel mouth, a pack of them patrol up the tunnel and if you're passing the mouth when they are coming out you can get double teamed in a big way. Once I went from 100% HP to 5% in about 4 seconds. Had about 15 hit me, 8 from below out of the tunnel and 7 from behind while I was stunned from the tunnel group. Also Grimfang is a caster. And Wetfang stuns you almost everytime he hits. Finally, I went in with 102 Swimming, ended with 200. Did you have to kill wetfang several times before he spawned? Info on where and who spawns this pesky minnow would be great!